There once was a time when Ronda Rousey was the UFC's brightest star, one of the biggest sporting and pop culture names in the whole wide world. For many, that's still the case and that Rousey steps back into the octagon after losing to Holly Holm to fight Amanda Nunes for the Women's Bantanweight Championship, is a mark of respect for what Rousey has done in Mixed Martial Arts and for the UFC. 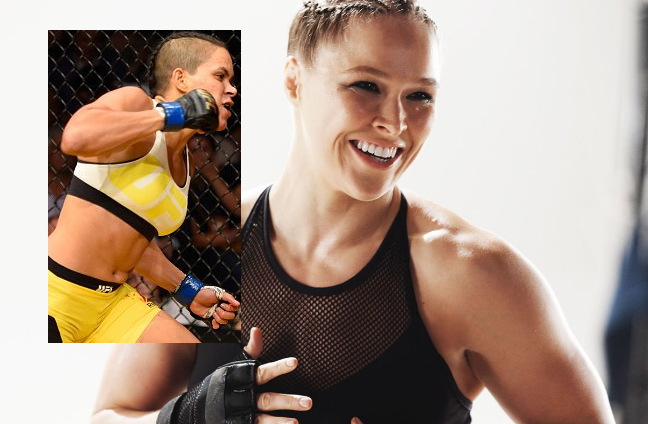 It would be difficult to form an argument however that Rousey is on Conor McGregor's level as one of the UFC's super-stars as McGregor has surpassed Rousey and Jon Jones while they have been inactive. Combine that with the low key strength of the UFC's women's ranks which saw Miesha Tate defeat Holm, only for Nunes to defeat Holm and become the UFC's first ever gay champion and you could be forgiven for thinking that the UFC and the MMA-loving world has slowly slid past Rousey and her relevance to the sport. Rousey makes her comeback this weekend and there's been a whole lot of noise about how she is going about this return. It's a weird little side-story as Rousey has been doing little media to help drum up hype for the fight, yet in the UFC's promotions for this fight it has all been about Rousey and her return; on the one hand Rousey is lurking in the shadows and on the other hand she's the only fighter in the spotlight for this fight. Mystery surrounds Rousey's return as we simply don't know how she is going to perform and to assume that Rousey will get back to business as usual, dismantling Nunes with some heavy striking, takedowns and that arm-bar, is a wee bit silly. Nunes' style doesn't really suit a fighter who is stepping back into the octagon for the first time in yonks as Nunes comes out hard, throwing all sorts of strikes and that onslaught in the opening rounds should ensure that Rousey is uncomfortable from the outset. For Rousey to win, she will either need to pounce at an opening offered by Nunes early in the fight as she attacks, or Rousey will have to absorb that onslaught and pounce later in the fight. Nunes has a habit of slowing down late, especially with a five round title fight, Rousey will back herself and her stamina to take down a fatigued Nunues in the last two rounds, which is likely to be her best chance. That mystery regarding Rousey will ensure that we all tune in and I reckon that mystery will also give Nunes an opportunity to ambush Rousey in the opening rounds. Rousey will know all about Nunes and how she goes about her fights, but after a lay-off, Rousey wouldn't have dealt with the striking and ferocity of striking that Nunes offers. Either way, we're going to be treated to a heck of a fight. If Rousey comes back and dominates then we've got one of world sports' genuine top-tier athletes re-establishing herself at that level. If Nunes blows Rousey aways, it's going to be excessively entertaining and Nunes would leave everyone with no doubt that she's the best; the belt has changed hands a few times during Rousey's absence and the champ simply needs to beat Rousey to seal the deal. The other title fight on this card has Bantamweight champion Dominick Cruz going up against Cody Garbrandt, continuing the rivalry between Cruz and Team Alpha Male headed by the now-retired Uriah Faber. Not rolling with Cruz here would be criminal as Cruz will use his typical movement to trouble Garbrandt and while Garbrandt will look to land heavy shots, with his power capable to knocking Cruz out, Garbrandt will likely spend much of this fight trying to suss out Cruz's movement from both an offence and defence stand point. Cruz vs Garbrandt has been brewing for some time as the two have gone back and forth at each other, gifting Garbrandt a title fight despite being ranked #5 in the bantamweight division. Before this fight goes down, we'll be treated to another bantamweight fight that actually involves the #1 and #2 ranked fighters in TJ Dillashaw and John Linekar. These two will do battle to see who will probably fight the winner of Cruz vs Garbrandt and with Garbrandt yet to defeat a bantamweight in the top-five, Dillashaw and Linekar have every right to feel a little frustrated. Cruz is undafeated in the UFC and undefeated in both the UFC and WEC since 2007, with his experience and unique style, I can't see Cruz being upset here. That could set up a favourable result if Dillashaw can defeat Linekar as a Cruz vs Dillashaw rematch would be a certainty and a must-watch fight. Lastly, this whole Mark Hunt situation is very weird in general, let alone from a South Auckland legend point of view. His stance on the Brock Lesnar positive test and now his stance on ensuring that a safe-guarding clause in a contract for a possible (it was announced by the UFC but not confirmed by Hunt) fight with Alistair Overeem is incredibly admirable, especially for us kiwis and South Aucklanders. The issue is that it leaves Hunt in a horrible position with the UFC. I love Hunt, but we need to keep it real about Hunt and what he offers the UFC right now; he's 42-years-old and has three wins from his past seven fights, excluding the no-result against Brock Lesnar. The honest truth is that the UFC don't really need Hunt right now and if Hunt is taking this admirable stance, he is only causing headaches for the UFC. We'll stay tuned to see how the Hunt yarn pans out, I just can't see Hunt's UFC career finishing in fairytale fashion if the current status-quo remains.